When Julie and I attended the Monsters University charity screening back in April we were lucky enough to meet director, Dan Scanlon, view the film and bid on exclusive artwork by many Pixarians. During the silent auction we were caught up in the bidding process for several pieces of artwork, but one that stuck out to Julie was a pencil drawing of young Mike Wazowski by Pixarian, Dice Tsutsumi. We were lucky enough to win an amazing piece by Robert Kondo but were outbid on the Tsutsumi piece. 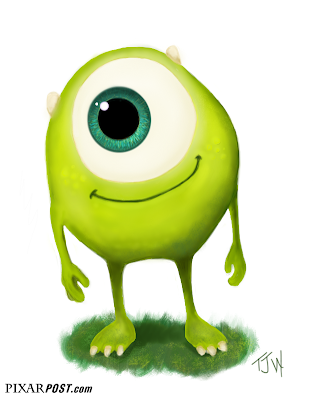 I always knew I wanted to create a young Mike Wazowski piece of my own based on Dice's work, but I realized that I had a very special reason to do so now. Julie and I are expecting a baby boy in late February and I wanted to create this to use as a custom drawing for our baby shower invitation and I thought, what would be a better image to use than young Mike Wazowski! When I started I wasn't sure if I wanted to do a pencil sketch or if I wanted to do a color version, so I just went where my inspiration took me. I opened up Sketchbook Pro and dove in by starting a quick red pencil sketch. 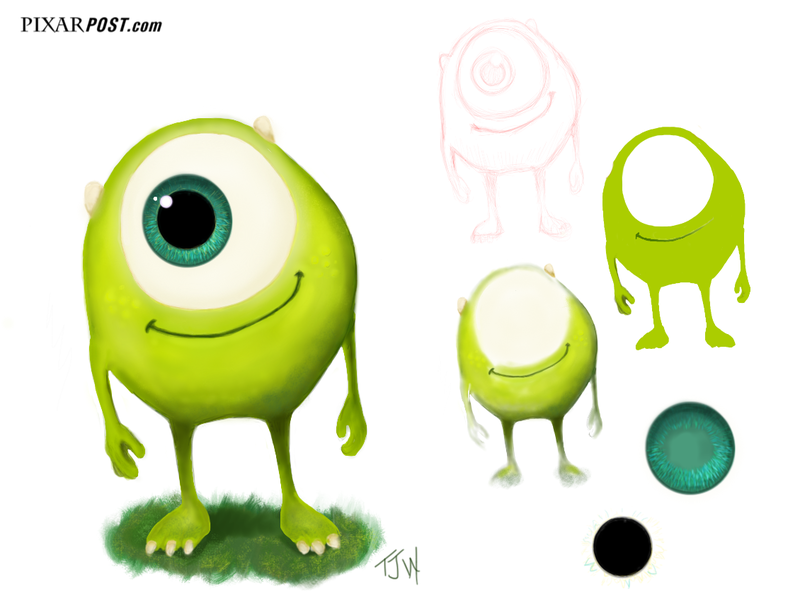 Following the rough sketch, I used a hard tip felt pen with 100% opacity to fill in Mike's signature ooze green color. I then used the airbrush tool to shade and layer varying green and yellow tones to shape his body and even threw in his subtle cheek and belly spots. Moving on to his eye, I knew I had to take my time and get that great glossy Pixar eye look. I created three layers and started with the base aqua color for his eye, shading the circle from top to bottom. I then used the chisel tip pen tool and tapped my pen with one dab of varying color at a time (while varying the slant around the circle) to create the depth. To finish off the iris I took a yellow and orange colored pencil and created subtle lines to create an even more realistic look. Finishing off his eye, I created a circular pupil and then added the two white catch lights (with a slight purple color cast around the edges). When I was wrapping up the drawing I went back through and added a slight ivory tint to the white of his eye and used varying pencil lines to accent the drawing overall. The final touch was to ground Mike by having him stand on a patch of grass. The entire time I was drawing this, I couldn't help but realize how much I was inspired by the artwork that I saw in the Art of Monsters University book. I realized how much I took away from reading and analyzing the pages and really tried to do Mike justice. Let me know what you think and if you've done any fun Pixar artwork recently - you can even post images of your artwork in the Fan Art section of the Pixar Post Forum if you'd like.